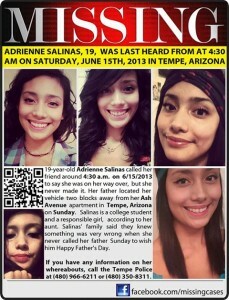 19 year old Adrienne Salinas has been missing since Saturday morning, June 15, 2013 . Salinas left her Tempe apartment near Gateway Community College at 3 a.m. and told her roommates she was going to drive to her boyfriend’s home in Scottsdale. She never made it. As reported at AZ Central, Salinas sent her boyfriend a text at 4:47 a.m. saying she was on her way, but never arrived and her cellphone was turned off at 5:07 a.m. Her car was reported to be in an accident at Ash and Rio Salado Parkway shortly after she left her apartment and it was found a block way, with front end damage and two flat tires. She has a tattoo of a sun on her left neck/ear area. UPDATE I: Tempe police searching for missing woman Adrienne Salinas. Police are searching for a 19-year-old woman who went missing after a night of drinking. Crews spent Monday night searching the bottom of Tempe Town Lake for Gateway Community College student Adrienne Salinas. Officers said they have no specific reason to believe her body is in the water, but they searched it with sonar to make sure. UPDATE II: Missing Tempe teen called cab before she disappeared. UPDATE III: Body found in Apache Junction is that of missing Tempe woman Adrienne Salinas. Sadly, authorities have determined that the the remains found in Apache Junction were that of Adrienne Salinas. Now the police face the task of trying to identify Adrienne Salinas’ killer. The police believe that this is a homicide case. However, there are no suspects identified at this time. The mystery that gripped the Valley for two months was solved Thursday when a badly decomposed body found in a desert wash in Apache Junction was identified as that of a missing 19-year-old college student. “I know she is in heaven and she is at peace,” Rick Salinas said, tearfully confirming the death of his daughter, Adrienne Salinas, who suddenly vanished June 15 without leaving a trace. Exactly two months later, Rick Salinas received the bad news in a telephone call from a police officer. Sgt. Michael Pooley, a Tempe police spokesman, also confirmed Adrienne Salinas’ death. Pooley said the state Department of Public Safety’s crime lab used DNA tests to identify the skeletal remains as those of Adrienne. 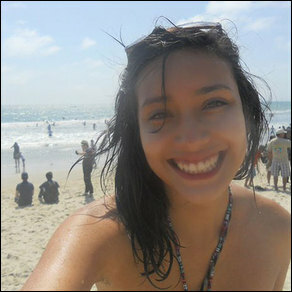 Anyone with information about Salinas’ disappearance or her location is asked to call Tempe police at (480) 350-8311.